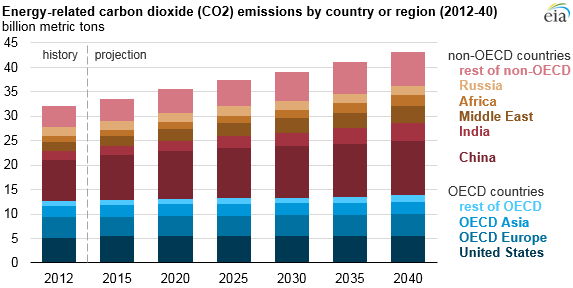 Global energy-related carbon dioxide (CO2) emissions are projected to increase by one-third between 2012 and 2040 in EIA's International Energy Outlook 2016 (IEO2016) Reference case, largely driven by increased energy use in countries outside of the Organization for Economic Cooperation and Development (OECD). The continuing increase in total emissions occurs despite a moderate decrease in the carbon intensity (CO2 per unit of energy) of the global energy supply. In conjunction with the 21st Conference of Parties in Paris (also known as COP21), many countries submitted emissions reduction goals, or Intended Nationally Determined Contributions (INDCs), under the United Nations Framework Convention on Climate Change (UNFCC). EIA has tried to incorporate some of the specific details, such as renewable energy goals, in the IEO2016 Reference case. The wide array of approaches generated by the COP21 participants includes absolute reductions, reductions from business-as-usual cases, reductions in intensity, peaking targets, and specific policy actions, making quantification of these goals difficult. In addition, the NDCs include elements beyond the energy sector, such as land use change and forestry pledges. Pledges include all greenhouse gases (GHGs), not just the energy-related CO2 emissions discussed here. Largely because of data limitations, EIA does not attempt to model every country individually but instead aggregates countries into 16 world regions. 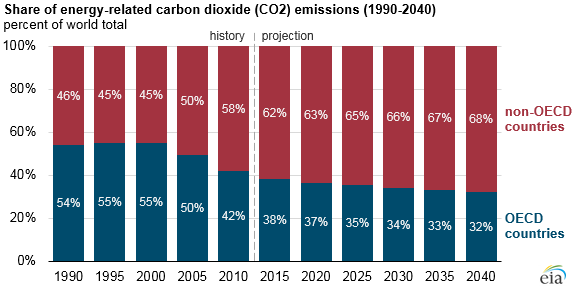 EIA's projections for energy-related CO2 emissions may change significantly as laws and policies aimed at affecting GHG emissions are implemented and as existing laws are enhanced. In 1990, the 34 current OECD member countries emitted 54% of worldwide CO2 emissions. Since then, economic growth and increased energy use in the non-OECD member countries have shifted the balance of emissions. The IEO2016 Reference case projects a continuation of the trend, with emissions from non-OECD countries increasing through 2040, while CO2 emissions from OECD member countries remain relatively flat. Even as energy-related CO2 emissions increase, the average carbon intensity of energy continues to decline. In the IEO2016 Reference case, global carbon intensity is projected to decrease by 0.4% annually, which is a more rapid decrease than the historical annual average 0.3% decline between 1850 to 2008, as noted by the Intergovernmental Panel on Climate Change (IPCC) in a recent report. In 2012, non-OECD countries emitted 62 million metric tons of CO2 per quadrillion British thermal units (MMmt CO2/quad Btu) of energy consumed. The 2012 carbon intensity of OECD countries was lower, at about 53 MMmt CO2/quad Btu. In the projection, non-OECD countries' intensity declines faster than that of OECD countries. Even with the more rapid decline, in 2040 carbon intensity of non-OECD countries is still higher than the 2012 carbon intensity of OECD countries. Energy-related CO2 emissions result from the combustion of fossil fuels: oil, coal, and natural gas. On an energy basis, coal combustion yields higher CO2 emissions than petroleum product combustion, which in turn yields higher CO2 emissions than natural gas combustion. A projected shift from higher carbon intensity fossil fuels toward fuels with a lower carbon intensity accounts for the reduction in carbon intensity. Two major factors drive this shift: growth in the use of renewable energy sources for power generation and a change in the mix of fossil fuels toward natural gas. Consumption of fossil fuels is projected to continue increasing but at a slower rate than the increase in consumption of nonfossil fuels. In 2012, fossil fuels accounted for 84% of worldwide energy consumption. By 2040, the fossil fuel share decreases to 78%, and the mix of those fossil fuels changes. Coal's share of fuel consumption falls from 28% in 2012 to 22% in 2040, the share of liquid fuels falls from 33% to 30%, and natural gas's share rises from 23% to 26%. Because natural gas and liquid fuels have lower carbon intensities than coal, the amount of carbon dioxide per unit of energy declines.